We said it a few months ago, and what once was a preparation, now has become a reality. After an intense and enriching work we can say that we are prepared almost in totaly for INTERSICOP 2017. And we say almost, because now we only need to greet your company in a couple of days starting Sunday 19 February. As national references in the production of cake and sponge sheets for the cake and ice cream industry, we could not miss this event, one of the most important of our sector in Spain, taking place from 19th to 21st of February in the fairgrounds of IFEMA. 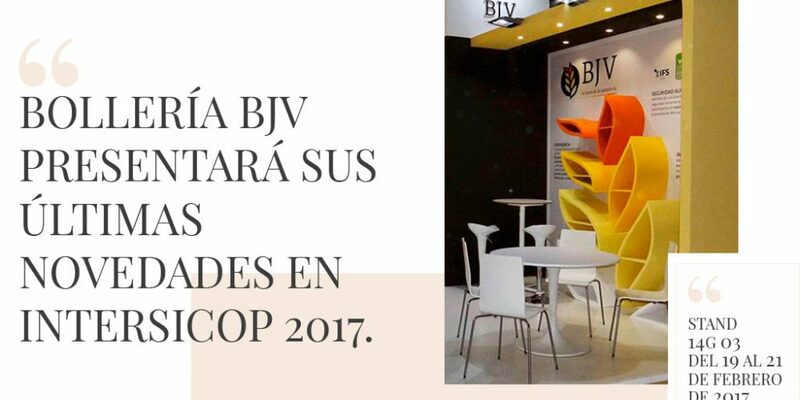 This year we will have a stand of your own and personalized inside hall 14, where you can find a great variety of sponge cakes and bases for the production of cakes and derivatives. Surely one of the products that will arouse most interest will be our range of special cakes, but of course, our sheet cakes and the latest developments prepared by our R & D team will be very present. As not, you will be also able to check the benefits of handling, homogeneity, texture and flavor offered by all our products. In addition, we have prepared a small detail that will sure sweeten the moment you choose throughout the day. Actually we could not be satisfied by presenting what you can already see in our newly updated catalog, but for all those who comes visit, we have prepared some new release that surely will not leave you indifferent. Always in the vanguard we have prepared some surprise only for lovers of the pastry and the sweet … or not. The BJV team will be prepared to receive you personally and resolve all your doubts or concerns. Remember that through our official twitter you can follow the news of these days, and know quickly what you can seek in our corner. A unique occasion prepared with much affection so that you can take advantage of it. Are you going to miss it?